The Tommy Hilfiger job application can be accessed via the company’s main employment site. Use the links posted on this page to go to the careers page. The instructions posted below detail the company’s online job search and application processes (as well as how to create an account/view the status of open applications). Numerous types of careers can be applied for (across several different job categories and countries). About the Company: Tommy Hilfiger is an American fashion manufacturer/retailer based out of New York City, New York. The company was created in 1985 and currently operates more than 1,000 retail locations throughout the world. Step 1 – The first step of the online job search process is to go to the company’s main employment page. Click here to have the employment page load in a new tab/window. Step 2 – Press the “Find a Job” link as outlined in red in the below screenshot. Step 3 – Press the “here” link (outlined below). Note: This guide covers the online hiring process for North American applicants. Step 5 – Click the title/link of the career that you want to start the online application process for. 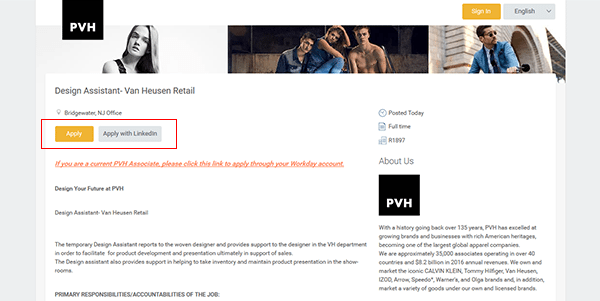 Step 6 – Review the job description and then press the button as outlined in the below screenshot. Step 7 – Use the “Quick Apply” section to upload your resume/cv/cover letter. 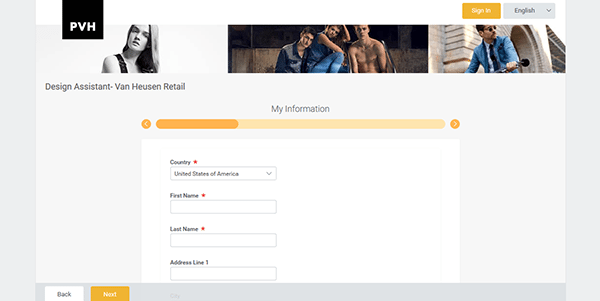 Step 9 – Click the arrow button near the top of the form to switch between sections. Continue to fill in the required details for any/all remaining sections of the form.